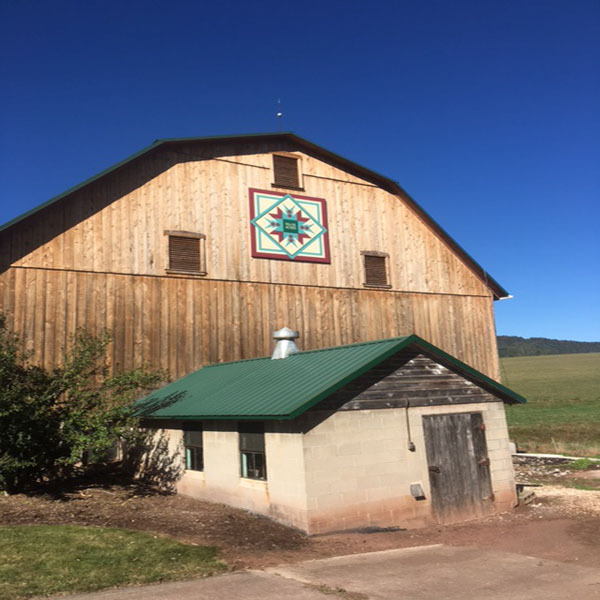 This barn quilt design is called INDIAN STAR, chosen because my mother, Vera Black who was an avid quilt maker and favored all star quilt designs. Wa-Ve Acres is from Warren and Vera Black who named the farm Wa-Ve Acres after purchasing the farm in 1950 from Sheridan Strait(farm known as SS Strait Farm, first 2 letters of their names) and because of contour farming designs in Fulton County. Also, Indian heads were often found on the farm in the 1900's. The choice of colors was easy as Warren is a John Deere man, alfalfa grower, and favoring anything green. Vera's favorite colors were magenta, mauve and maroons. The barn was built in the 1800's, burnt twice, in 1930 was struck by lightning and in the 1940's mysteriously set afire. The original framing and rebuilds were made of chestnut. In 2015, grandson Troy Parsons, current owner, resided the barn with hemlock. We still call the barn "Pap's Barn."